The guy in this video acts like a real jerk and a baby! They fill his office with balloons and he gets very upset about it. What a dork! Funny prank video. A group of guys make people think that they are about to be hit in the head with a baseball. Ok this audio file may sound a bit confusing but once you understand what is going on it is really funny. This is a great prank phone call that was made to two Chinese restaurants. This is a hilarious practical joke caught on tape. This guy is about to do some kind of medical procedure on a dead body when it moves and scares him half to death. Funny Prank! Super funny prank video! A television show ties a fake deer to the hood of a car and makes it talk to people who walk by. This funny video is really great! Some loser decides that he is going to throw a cup of water on a lady who is giving him his order in a drive thru window. 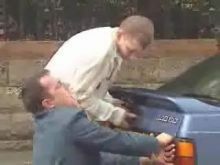 His plan backfires because he cant get the car into gear! What a loser! The old fake glass door prank gets em' every time. Next time I walk up to a door like this I am going to push on the wooden part. Here is another video of someone scaring a bunch of their friends with one of those flash screamers. I wonder how many of them hated him after this? Funny Video! A guy plays a prank on his boss by wrapping ever thing in his office in foil. I dont want to give away the end of this funny office prank so just watch it. This really is a must see. This is a hilarious video! A man dressed up like a scarecrow scares people on the street. These peoples reactions are too funny! If you see a scarecrow on the street without a head leave it along. A big THANK YOU goes out to Guzer member LKAY for sending this one in! Have you ever changed around the letters on a sign to make it say something funny? Well the guys in this video have and they caught it all on camera. Great prank video! A guy makes people think that his hand has been slammed in the car trunk. They rush around in a panic trying to help him get free. Funny prank video. This man hides fake drugs on some people and then has a fake police officer search them. This is how easy it would be to get framed for having drugs. Two guys sneak up on their friend's cubicle and pop him with a huge rubber band! They score a direct hit and you can tell that it both hurt and scared the poor guy. The kid in this video must have been inspired by the drive thru prankster we posted a while back. He buys an ice cream then throws it in the girls face. What a waste of a dollar. Hilarious video of a great office prank. They set up the ceiling tile to rain down packing peanuts on this ladies head and into her cubicle. At least she had a good attitude about it. A group of guys are coming back from a road trip when one of them falls asleep. The rest of the guys decide to play a joke on him by screaming to wake him up. His reaction is priceless! A guy passes out drunk and his friends pull the old shaving cream trick on him. Man this guy is really out of it. At one point he thinks he has glasses on! I thought this video was funny. The funny part is what the sister says when she gets woke up with a slap. You might need to know a little Spanish to understand what she says. This is another funny prank video. This time they make people think that they have pulled the table cloth off of a table. This guy wants to drop a bag of water out the window and on to someone's head. Good college prank video. This guy has awsome aim and that chick has been owned! A man dresses up in a zombie suit and scares people as they walk through a park. Some people were just a little spooked but some people took off running in fear! Great prank video!